Submitted by Jeff Buster on Mon, 12/24/2007 - 19:06. On December 14, 2007 Judge Gaul presented University of Northern Virginia LLC’s president, Mr. Ho, to Myers’ students and the media at Myers University in Midtown, Cleveland, Ohio. Mr. Ho’s English is a bit difficult to follow, but what I made out was that Mr. Ho had in the past been a professor, and he still considers his relationship to the various for profit schools he operates as that of a professor – Mr. Ho is not currently teaching as a professor, but is negotiating the take over of the Myers Board of Trustees. As of December 20 Mr. Ho had appointed eight of his candidates to the “Board” with Judge Gaul’s approval. Mr. Ho (center with glasses), and his associate Mr. Lee (on right with glasses and striped tie) went on to say that it was their intention to expand the student population at Myers by attracting foreign students – with a goal of about 2,500 students. But what Mr. Ho did not explain – nor did Judge Gaul or anyone else explain - is how the involvement of UNVA (a for profit school) with Myers University (a not for profit school) made bottom line sense. 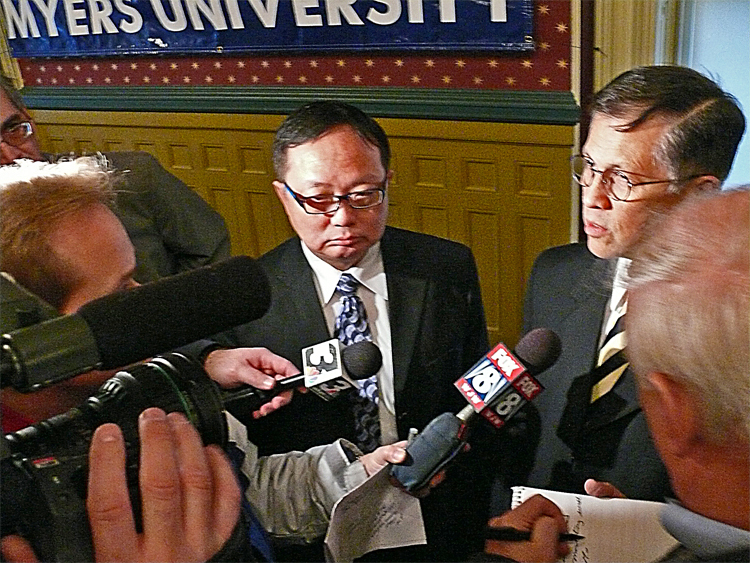 After the media event, I asked Mr. Ho's Cleveland attorney, what the motivation was behind UNVA's interest in Myers. The attorney wasn't clear, or wouldn't say. After checking out the UNVA web sites, and Googling to pick up chatter about UNVA (and there is very,very little chatter – too little chatter), I am of the opinion that UNVA is a mechanism for foreigners with money to be admitted immediately into the United States – with their dependant families if they wish – and let them get a job. F1 visa holders are not allowed to attend public school – unless they reimburse the public schools the cost associated with their attendance. This public school restriction (payment) applies only to students holding F-1 visas. The restriction does not apply to students attending public school on derivative visas, such as F-2, J-2 or H-4 visas. The restrictions also do not apply to students attending private schools on F-1 visas. This means that the dependant children of F1 visa holders can attend public school free. this is the Hobson's MBA overview link to UNVA. here is the College Board web site for UNVA – note that it lists only 10 students enrolled, and here is a link to UNVA’s Beijing office – which I bet is just a collection point as I bet the Prague site is also. The UNVA site is here – it’s server was down a few days ago and today the Praque University site is down – “page cannot be found”. I spoke with a friend who knows the ropes in the Slavic countries – he said the University of Zagreb is free to Czech students, and pointed out that no one from Czech would pay 11,000.00 euros (UNVA’s fee for foreigners) for schooling if there was not something more to it than “school”. In order to make bottom line financial sense, UNVA could divide the “tuition” payments – some of the money (enough to cover costs of teachers and the campus) going to the non-profit Myers and the rest of the money going to UNVA for “logistics”. I predict that fewer and fewer Clevelanders will attend Myers; for two reasons – it is too expensive, and because UNVA will want to fill the roster with foreigners who pay UNVA for the “logistical” costs of getting them into the USA. If Myers University becomes an F1 Visa Factory, as I suggest above, is it appropriate that our County Port Authority leave their 5.7 million loan in place? Or, since that loan was in default under Mr. Scaldini, should the Authority pull the money out? Submitted by lmcshane on Thu, 12/27/2007 - 16:41. Great reporting Jeff. I hope that Myers does becomes a F1 Visa Factory--consider the location of Myers--central and really part of the proposed Design District/Asia Town with access to libraries, universities, free wi-fi and transportation (Euclid Corridor) and cheap housing. And, unlike some immigrants to the city, part of the Asian community seems committed to the city. Wow. So cool. Submitted by lmcshane on Thu, 12/11/2008 - 08:40. It looks like Myers University has turned around. What good news is available? Case Western Reserve University has improved its financial standing. How were these institutions able to regroup and recover?